Have You Ever Worried Your Baby Suffered Acid reflux and Nasal Congestion? △△12 Degree Incline Wedge Helps to Baby's Healthy Sleeping,Reduces Nasal Congestion Caused by Colds and Flu As Well As Discomfort Caused by Acid Reflux by Gently Raising the Baby's Head to Optimum Height. △△Extremely Firm Bottom Ensure the Crib Wedge Stand Safely. △△ Also could be used as pregnancy cushion for back and belly support! ①To prevent pillow wedge movement or gaps on the sides, for more safety, it's advised to place the wedge under the mattress. ③ In order to prevent flipped,ensure only the baby's back and head on the wedge elevation. 1.Never use it near the heat sources,such as stove,fire,radiators ect. 2.When wash the cotton cover,please take out the memory foam firstly. 3.Don't leave your baby unattended. 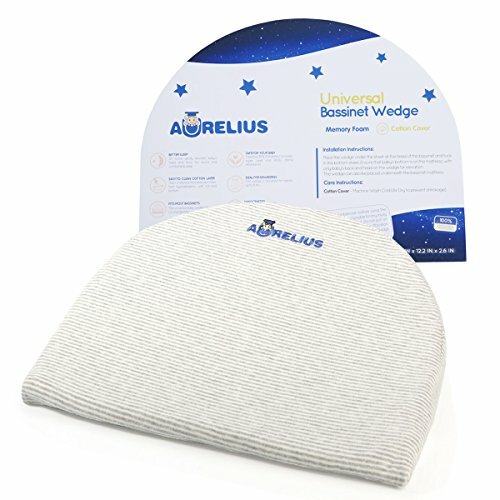 BEST SLEEP PILLOW FOR PARENTS AND INFANTS:Has your baby ever been awake more frequently due to acid reflux happening throughout the night or during naps?Now this bassinet wedge will give your baby perfect comfort, allowing you and your little one to fall fast asleep. If you have any questions about this product by Aurelius, contact us by completing and submitting the form below. If you are looking for a specif part number, please include it with your message.